Suspicious Heuristics: Bedbugs. Yet another reason to hate Rachel Carson (aside from 800 million dead of malaria). Bedbugs. Yet another reason to hate Rachel Carson (aside from 800 million dead of malaria). The history of malaria is interesting, in a macabre sort of way. A hardy parasite spread by insects, the cause of malaria was unknown for most of human history. The name we know today comes from the French phrase for "bad air," reflecting the common observation that malaria cases peaked around swampy areas. Their solution in Algeria - drain the swamps - was effective, but costly. Malaria, the organism, is extremely difficult to kill. However its crucial vector, the mosquito, is vulnerable when combated with the correct chemical tool. In 1939, Paul Mueller discovered just that: DDT. This insecticide is cheap, effective, and quite safe for humans. Some claim it causes cancer, but their evidence has since been disputed. By comparison the malaria problem is undeniable and catastrophic, with millions dying on a yearly basis. As said by Wenceslaus Kilama, the Chairman of Malaria Foundation International "this is like loading up seven Boeing 747 airliners each day, then deliberately crashing them into Mt. Kilimanjaro. "The imagery is hard to overlook. The history of bed bugs is less interesting, but in a much more annoying way. Like malaria, bed bugs have plagued humanity since the dawn of time. They cause irritation, swelling, and definitely a terrible night's sleep. We're still combating this invasive parasite as well -- a national Pest Convention is meeting to discuss the issue. 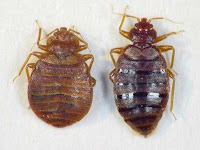 Exterminators have been caught by surprise as bed bug infestations have sprung up in the last several decades across the country, and surprisingly little is known about them. What do malaria and bed bugs have in common? They've both been increasing since DDT usage was halted thanks to Rachel Carson's book, Silent Spring. Some people claim that bed bugs' modern upsurge is just due to increased travel. I think the facts say otherwise, given the almost total eradication of bed bug cases during the heyday of DDT's popularity. That issue aside, there's no disputing the deadly impact of malaria -- a plague that can easily be prevented by regular spraying of DDT. The public outcry prior to the DDT ban is a classic example of action taken without full understanding of the consequences. Enough has been written on this already, so I won't belabor the point. Ultimately, Rachel Carson isn't the only one to blame; fault rests with the politicians and lobbyists who listened to her before all the evidence was in. Now, the public at large is feeling the consequences from decisions made forty years ago. With bed bugs infesting the Big Apple, maybe it will get people itching for change in our national pest control priorities.